A bored dog is not a happy dog. But, you can’t be there for him 24/7, ready to be his playing partner whenever he wishes to play. What you need to do is try to figure out how to keep your dog busy while you’re away. Regular work hours are from 9 to 5, so you’re not gonna be home during that time. Your dog, on the other hand, doesn’t go to work. That means that there will be a couple of hours every day when he’s going to be left on his own. And that might make him feel bored. Here are a couple ideas on how to prevent that. Dogs can’t see in 2D – he won’t be able to recognize your face on a photo. But, he can see 3D images, like the ones on television screens. This means that if you turn the TV on, he will be able to see and even understand what’s going on there. Sure, he won’t understand how it got there, but he will able to recognize dogs or other animals on TV. Add to that the sounds the program creates and you’ll have a dog glued to the screen while you’re away. The problem is that not all kinds of moving images will grab your dog’s attention. It’s like with humans actually, some people love history documentaries, others prefer watching sports matches on TV. 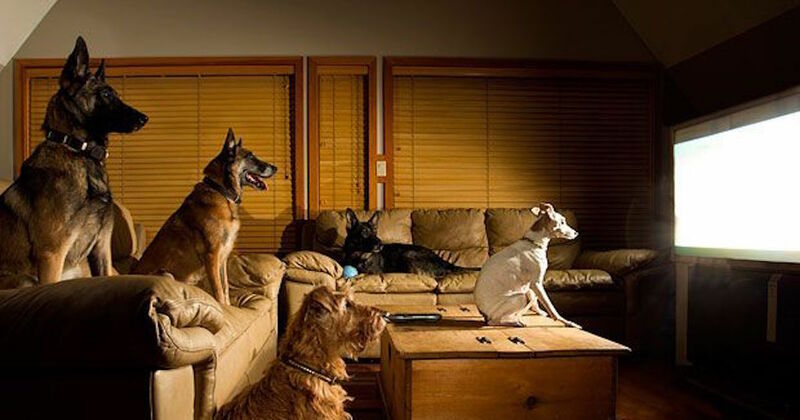 So, before leaving your dog in front of the TV, make sure that the program that’s on is actually interesting to him. Generally speaking, dogs love watching other dogs, as well as other animals, including those they’ve never seen before. So, Animal Planet should be a good choice. Dogs love chewing. But, some things you have in your household are not meant for chewing. We’re talking about things like furniture, clothes, etc. Instead, you need to give him something that’s ideal for this purpose. A squeaky toy could be interesting, but most dogs find such toys boring after a while. A much better option is to give him a big bone. There are several reasons for this, starting with the fact that he won’t be able to injure himself or break his teeth while chewing a bone. That wouldn’t be the case if the nibbled on a piece of metal, for example. Another reason why a large bone is a good choice is that it’s of animal origin. And that makes your fluffy friend turn into a predator. A bone will make him mouth water and he won’t stop chewing it until there’s nothing left. And that’s exactly why the bone needs to be large. Otherwise, he’ll eat it long before you’re back home. You surely have a friend or a family member who also has a dog that needs to stay alone for several hours a day. So, why not team up and keep the dogs together? When they’re in company, they’re guaranteed to have some good time! Dog boarding centers have become a very popular thing lately. How they work is that you bring your dog to the center and leave him there for as long as you wish. Why would you want to do that? Because he will be taken care of by professionals. Not only will he get all the food and water he needs, but they’ll also take him for a walk and even let him play with other dogs. 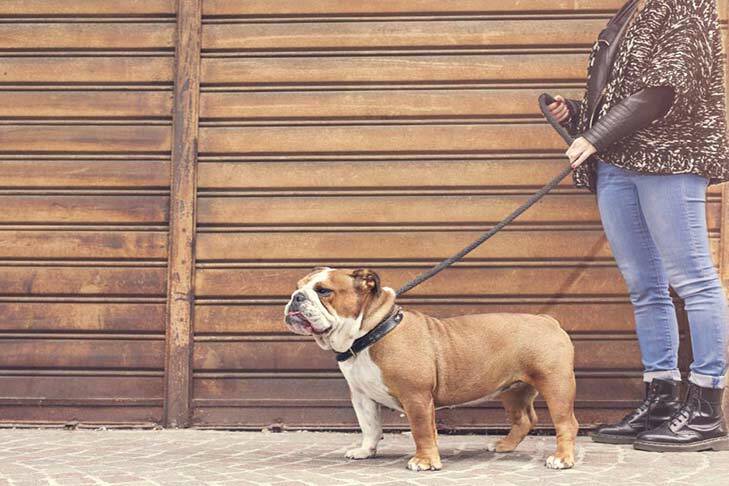 If you don’t have enough time to walk your dog on a regular basis, he might get fat, as well as end up suffering from various health issues. In fact, various studies have shown that those dogs that don’t get enough exercise often suffer from heart problems, diabetes, kidney problems, etc. Furthermore, dogs that lay around all day take more time to recover from even some really mild health problems, e.g. treating a hot spot can be really difficult if your dog is inactive. To prevent such scenarios from happening, you can hire a professional dog walker to take him out while you’re away. 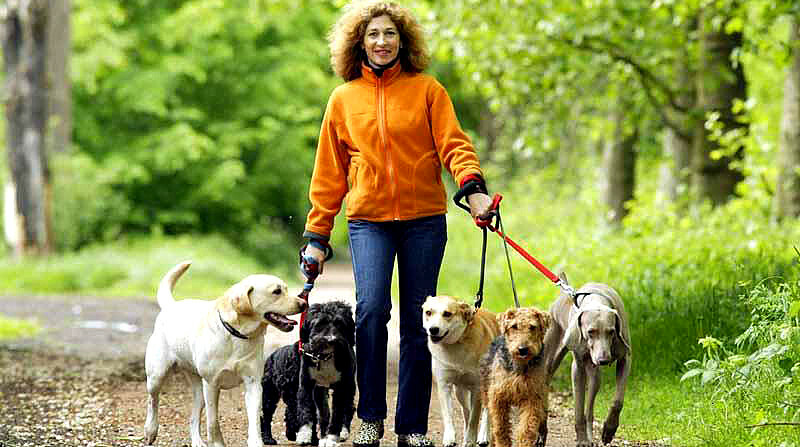 The internet is full of websites where you can look for a dog walker in your area. Before they were domesticated some 15,000 years ago, dogs used to live like wolfs. While in the wild, they were hunting at night, while sleeping during the day. Their bodies are still meant for such a regimen. However, humans are not, so dogs had to adapt. The problem is that even though your pup will try to stay awake during the same hours as you, the thing is that his body is built differently. His nature makes him stay awake at night, while his owner makes him stay awake during the day. The result is that he might not be getting enough sleep. The solution is to help him get some sleep during the day. Unfortunately, considering that every dog is basically a guard dog, he might think that it’s his duty to stay on guard while you’re not at home. In order for him to get some sleep, you need to play your part. The things you can do for him include applying calming essential oils to his bed, setting the right room temperature (75-78 °F), or giving him a pet sedative that will put him a sleep fast (e.g. acepromazine). 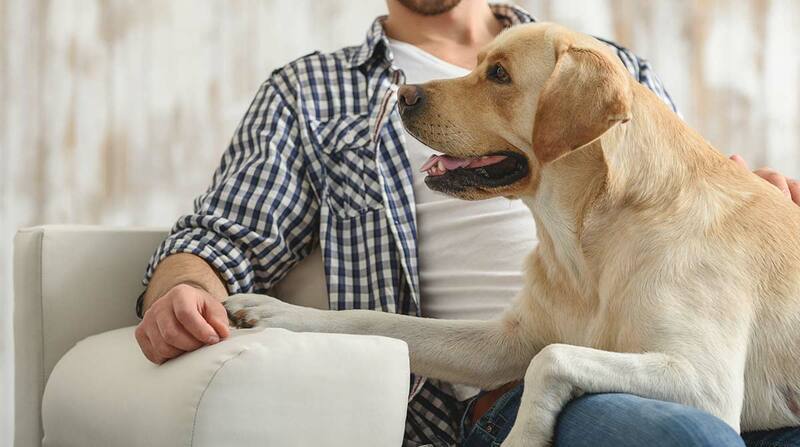 Even though it is very important to keep your dog entertained during the day, what’s even more important is that he remains safe while you’re away. Puppies can be naughty and if you’re not around to stop them, they can do some really dangerous stunts. So, before going away, make sure that there are no plugged cables around that he could chew and get electrocuted. Make sure that the windows are closed, so that there’s no way he could fall out from the window. Also make sure that there are no pillows or items of clothing that he could get ahold, as some dogs just love to destroy stuff. Finally, make sure that your pup has enough food and water, and that there’s a litter box that he can use as a toilet. CBD pupper treats are very nutritious and provide a new way to treat your dog of specific ailments such as anxiety. Before we look into the best CBD currently in the market, what exactly is CBD and what benefits does it have? CBD is a cannabidiol oil extracted from hemp. Hemp is from the cannabis family, but unlike regular marijuana, it doesn’t contain tetrahydrocannabinol (THC). THC is a chemical found in regular marijuana which gets you high when you smoke pot. Dogs are not tolerant of THC. Unlike humans, dogs contain a higher number of neuroreceptors which make them highly sensitive to THC. For this reason, it’s not advisable to sneak your dog edibles made from marijuana as it might even end up dead. CBD produces no psychoactive effects and has very minimal side effects to your pet if any. Over the past few years, CBD has become very popular due to its health benefits both as a supplement and a remedy. Because of the high concentration of CBD oils, they are integrated into pets’ treats to make sure the right dosage is given to your pupper and makes it easier for them to ingest. They contain: Cured Bacon/Organic Turkey/Organic Bananas, Organic Maple Powder, Cannabinoids, Cinnamon, and Organic Barley Flour. Their ingredients are organic which help promote the wellbeing of your dog. Canna-Biscuits are some of the best quality dog treats as they are made with 100% organic ingredients and contain the best CBD oil in the market-The Advanced MaxHemp Extract. Ingredients: Hemp, Oat Flour, Almond Meal, Maple, Molasses, Flax Seeds, Coconut Oil, Apples, Turmeric, Rice Flour, Cinnamon, Peanut Butter, and Probiotics. This treats are handmade and come in a peanut butter-and-apple flavor. They come in two varieties of 2mg and 5mg CBD. This helps you to choose well for your dog depending on its need and size. Ingredients: Phytocannabinoid Rich (PCR) Hemp Oil, Ground Peas, Salmon Oil, Sweet Potato, Ascorbic Acid, Green-Lipped Mussel, Ground Chickpeas, Tapioca, and Garlic. PCR hemp oil provides a wider range of cannabinoids which makes Healthy Hemp Pet CannaNatural treats one of a kind. Apart from the PCR benefits that they have, they contain green-lipped mussel which is an excellent source of chondroitin and glucosamine making it particularly beneficial to dogs with joint problems. This is the best for dogs suffering from arthritis, muscle fatigue, and joint issues. Want to learn more about CBD Dog Treats? Check out this website! Ingredients: Pumpkin, Full Spectrum Hemp, Rice Flour, Tapioca Starch, Garbanzo Bean Flour, Apples, Eggs, Coconut Oil, Mint, and Parsley. They are handmade using 100% organic ingredients in small batches which guarantee that they are fresh. This makes their quality very high. Ingredients: the essential ingredients are Brown Rice Flour, Molasses, Cinnamon, Hemp Seed Powder, CBD Oil, and Coconut Oil. They contain extra constituents for each category of HolistaPet Organic CBD Dog Treats which are: Green apple and peanut butter for stress and anxiety relief category; pumpkin spice and cinnamon for joint and mobility care category; and blueberry and sweet potato for heart and immunity care. Honest Paws CBD come in three varieties: the Honest Paws Restore, Honest Paws Relief, and the Honest Paws Calming. 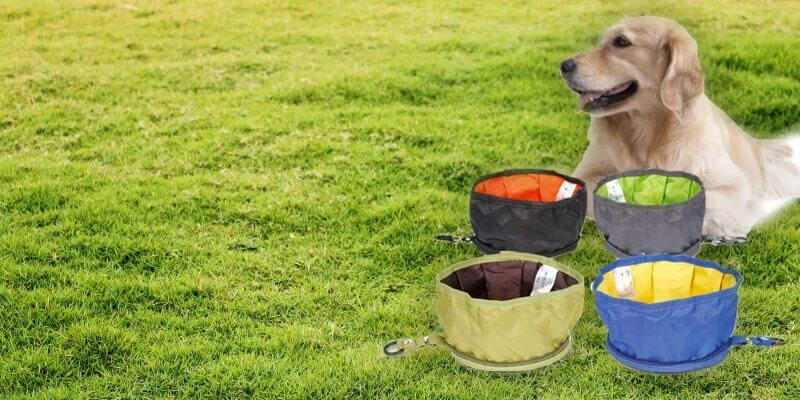 This makes it perfect because you can choose a range that works best for your dog. PCR Oil, Krill Oil, Turmeric, Black Peppercorn, and Oat Flour are the basic ingredients. In addition to the above ingredients, different flavors have extra components which include: organic apple and cinnamon for apple cinnamon flavor; sweet potato, eggs, blueberries, honey, flax seeds, and diced apples for blueberry flavor; and rolled oats, almonds and honey for the oat flavor. The krill oil contained in all King Kalm Crunch has health benefits. It improves cardiovascular health and reduces inflammation and pain. 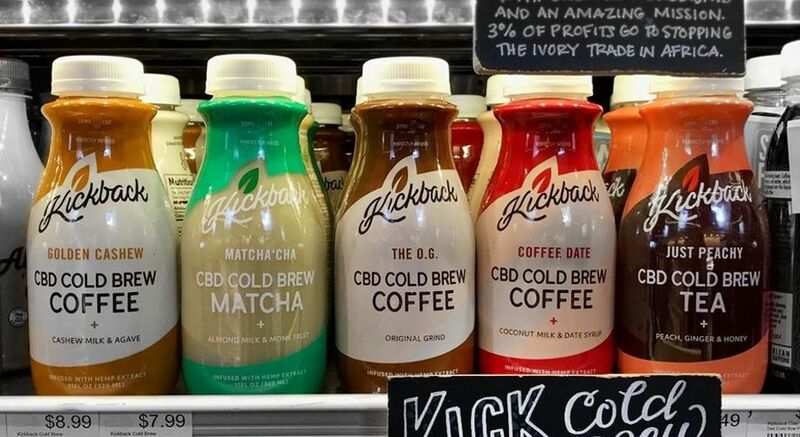 Ingredients: Organic Flax Seed, CBD Oils, Potato Starch, White and Brown Flour Rice, Nutritional Yeast, Organic Chicken Soup, Cage Free Eggs, and Parsley. Because of their chicken flavor, they are suitable for even the pickiest dogs. They are handmade from 100% naturally occurring ingredients which have a multitude of benefits to our dog’s health. Treatibles was the first company to introduce PCR oil. They offer several flavors with different sizes and varying concentrations of CBD to accommodate both big and small dogs. 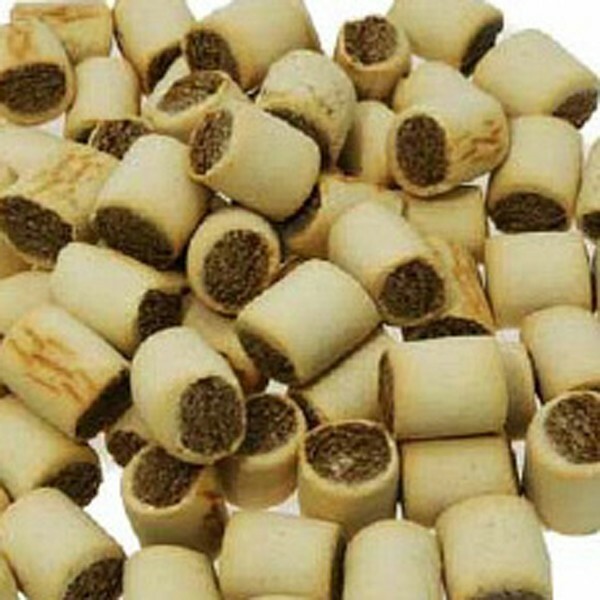 They are the best treats for small dogs. Ingredients: Ginger Root, PassionFlower, CBD Oil, Valerian Root, Vitamin E, Ascorbic Acid, Calcium Propionate, Cane Molasses, Cheese, Glycerin, Lecithin, Rice Bran, Rice Flour, Safflower Oil, Tapioca Starch, and Sorbic Acid. The treat contains unique ingredients such as Passionflower which produces calming effects; ginger roots which have anti-inflammatory effects; and valerian roots which reduces anxiety. The dog treats mentioned above are produced by known and trusted companies using pure CBD hemp oil which is the safest for your pupper. Though some are expensive, it is better to be safe than to try to save a few bucks only to end up giving your dog treats full of toxic THC. When it comes time to find the perfect pet sitter, you want to ensure you chose right. After all, we’re talking about your beloved four-legged friend here. 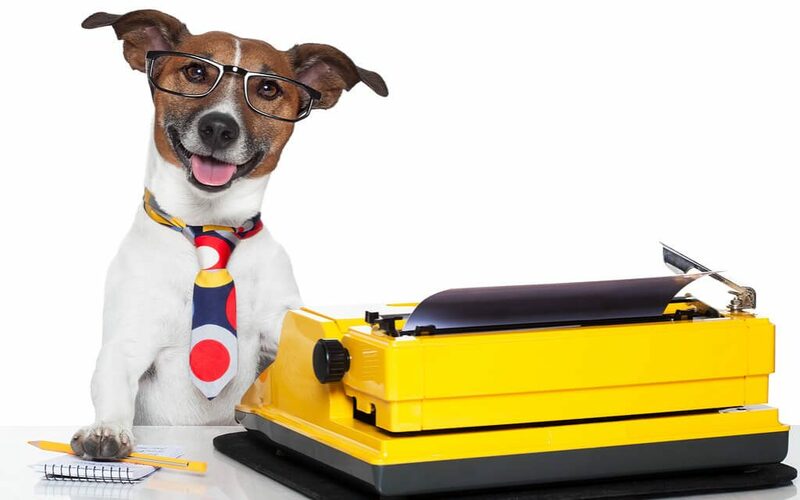 While you’re on vacation or a business trip, a pet sitter will watch over your dog or cat, feed and water them, and manage daily walking schedules and clean-up. It’s a lot of work. It’s also a lot of responsibility. 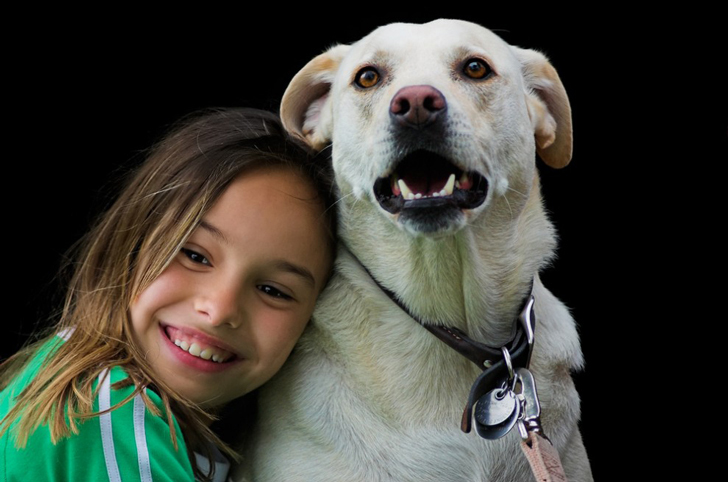 Here are a few qualities that make a fantastic pet sitter! The best type of pet sitter imaginable is one who is honest, trustworthy, and passionate about their role in your home and your pet’s life. A dishonest pet sitter is one who does not care about the job. It’s nothing more than a paycheck at the end of the day. You don’t want this type of person caring for your furry friends. If something were to go wrong, the honest, passionate pet sitter will do everything in their power to right the situation. To ensure the utmost safety and security of both you and your pet, you’ll want to ensure your chosen pet sitter has insurance, licensing, and is bonded. A pet sitter with all of these factors will show that they are serious about their duties. 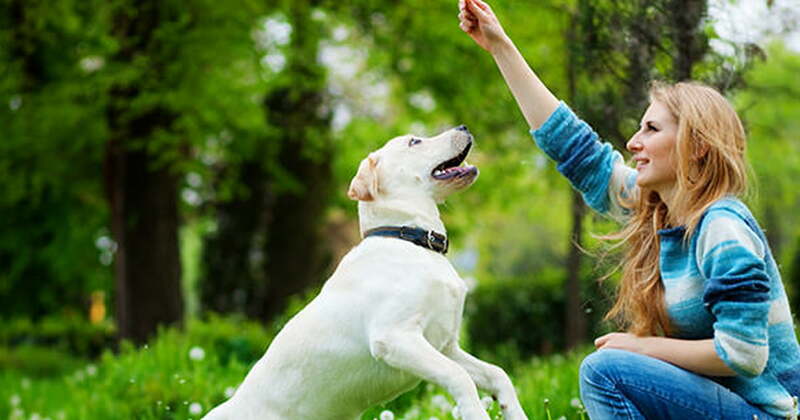 Their business is designed to provide expert pet sitting services. With a thorough guarantee in place, you can rest a little easier while away from home for the time being. Now, your pet sitter does not need to be a highly-trained veterinarian or hold a doctorate of any type. They should, however, understand pet behavior. The right pet sitter for your household is friendly, understanding, and knows when your dog is feeling anxious. Ideally, your pet sitter will be familiar with your dog a as a whole – their personality, likes, dislikes, and fears before they pet sit in your home for any considerable amount of time. Just like with children, pet emergencies can crop up at any time. You need someone who is prepared and level headed throughout any ordeal. If something bad does happen, your pet sitter must know basic medical training for pets. This training should include first aid and CPR. Furthermore, they should be able and willing to follow any instructions you leave behind regarding emergencies or how to properly care for your pet, including medications and routines. Lastly, your pet sitter should be flexible. It is a simple quality but one that makes a significant difference in the day to day tasks of a pet sitter. Do not hire a sitter that has a long list of tasks they refuse to complete, such as mess clean-up. 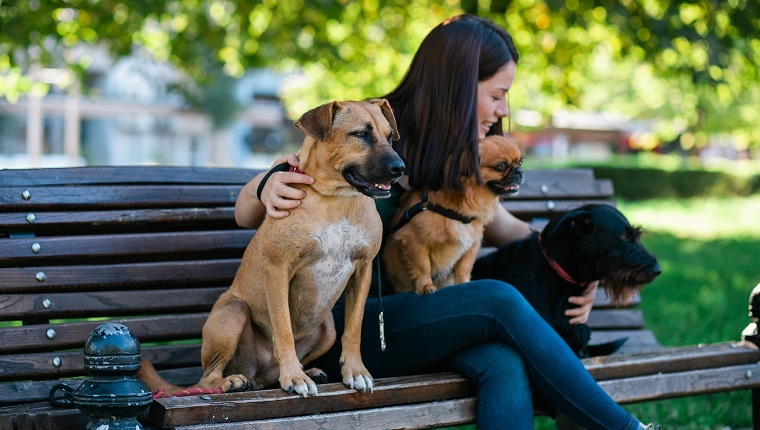 With these five qualities in mind, you’ll be on the path to finding the perfect pet sitter to meet your needs and that of your beloved pet, too! When human beings claim to suffer from painful discharge and bad odor, they need not forget that animals; especially dogs also find themselves in the same situations. Veterinarians are trying every attempt to find the most effective ways of relieving dogs from hot spots; the painful and inflamed areas on the skin of the dog. Just like allergy in humans, hot spots result from allergic reactions when the dog’s skin gets infected by bacteria. This causes the skin to break thus leaving painful wounds. Some of these infections result from flea bites, scrapes, scratches and gland problems among others. But suppose your dog yells now and then due to the pain suffered from these hot spots, how do you get rid of them? The following are some of the ways you should employ and your dog will no longer have sleepless nights. 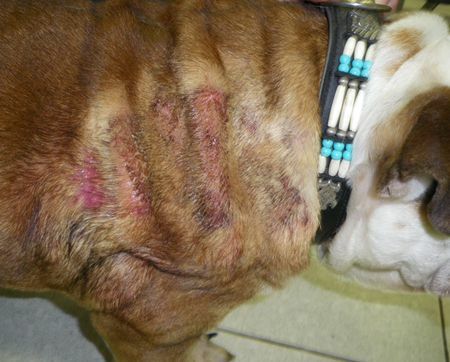 Hot spots are painful, and they can be made worse if the dog is locked up in a place where it has no access to air. The long hair makes the moist red areas not to dry, thus making it take ages before getting healed. If your dog has a hot spot, it will show it by paying too much attention to the infected area, so, be keen to check and determine its size. Ensure that you trim the long hair to clear the irritated skin to make it dry. Trimming the hair prevents it from overgrowing, and by the time it grows again, the wound will have healed. If the skin is itching, it’s very sensitive to various fibers and chemicals. However, you don’t need to use chemicals to clean the dog’s skin. Just use the baby shampoo to protect the skin from further damage. Also, use a cotton ball to apply the shampoo. But you need to be careful not to rinse the skin after the message. The skin needs to absorb the shampoo so as to facilitate the healing and cool the skin irritation. The irritating hot spots on dog’s skins are so sensitive to various creams and lotions, despite the fact that they are somehow tender and warm to touch. Instead of going for many lotions and creams, just try cortisone spray to cool the skin. This also applies as a kind of medication, and it prevents the dog from keeping on scratching the irritated area. Most dogs have the instinct of scratching and licking the damaged skin. The dog doesn’t know that this can cause further damage to the skin, but if you let him do it, the hot spot may take ages to heal. You can prevent the dog from licking the moist area by tying a funnel collar around his neck, to prevent him from accessing the skin. This will prevent him from further injuring himself. You don’t need to worry about the cost, the collar funnel is relatively cheap and you can get it from your vet. Be keen to choose the right size for your pet so that it’s neither too tight nor too loose. The tannic acid found in tea has the ability to treat and draw out bacterial infections. If you are lucky to either get green or black tea, then your dog will definitely get cured. Just seep a single tea bag of either of the two in a cup of water and remove it. After the tea bag has cooled down for some minutes, soak it directly on the hot spot. Repeat it several about 5 times a day for one week, and at the long last, the hot spot will heal. 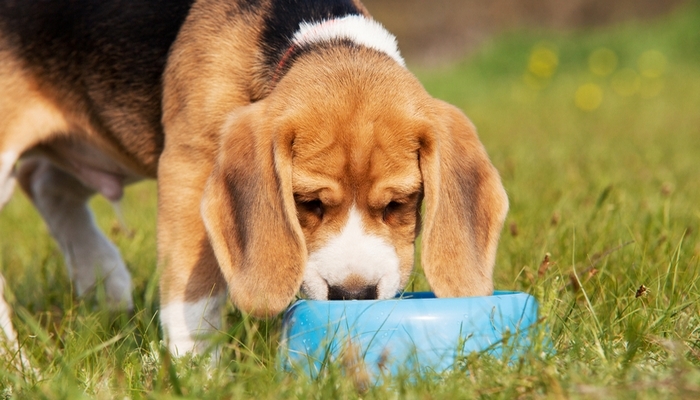 Your dog may just be suffering from food allergies. If you’re his current foods are not making things better, switch him to quality dogs food. For instance, you can pick the Blue Wilderness from your vet or the pet stores. The dog only needs to eat just a small amount of these foods due to their high quality. Some of the vets are just good at treating symptoms rather than finding the cause of the hot spots. Your vet may be treating the dog without even knowing that these hot spots are caused by the poor immune system of the dog. If the condition rises far beyond the vet’s ability to treat, consider engaging another vet. The itching will make your dog scratch his skin every time an irritation occurs. Try trimming his nail to prevent him from having a ready way of scratching the infected area. 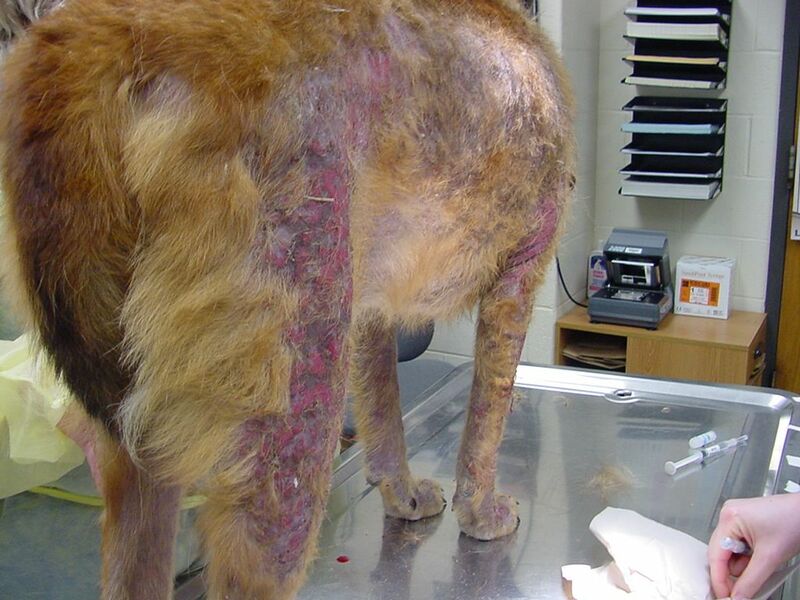 Vets usually prescribe oral antibiotics for hot spots treatment. Depending on the nature of the skin damage, you are supposed to treat your dog using oral antibiotics for 3-4 weeks, and if the damage is extreme, extend the treatment to 6 weeks. The pain can also be relieved by treating the dog with a short course of corticosteroids, due to the inflammation on the skin. Antihistamines can also be used to relieve itchiness and pain. Fleas will lay on the grass waiting for your dog. If you have been applying chemicals on this grass after every 4 weeks, adjust it and do it after every 3.5 weeks. Fleas are dangerous and a couple of them is good enough to make your dog yell in pains throughout the night. The dog can get tormented by many things outdoors; heat, mosquitoes, grass, and fleas, they will reproduce when your dog stays outside for long. Keep the dog indoor and let him cool the skin. The pill form may not work well for your dog, but be sure that shots will actually help. Although there will be a risk to the dog’s kidneys, the proper application will see him living for more than 12 years with just 3-4 shots a year. 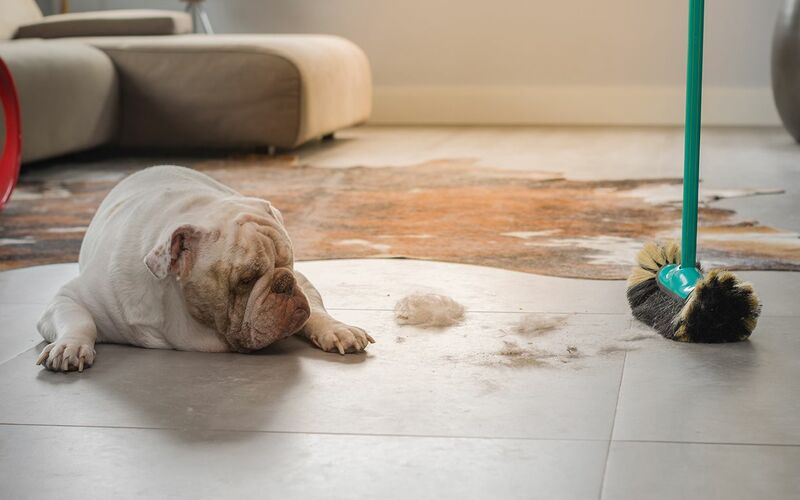 Hot spots are painful to a dog, and since you love your pet, it’s the high time you make limitless attempts to save him from the pain and agony that comes with these skins irritations. Try these 12 tips and he will definitely live a happy life. 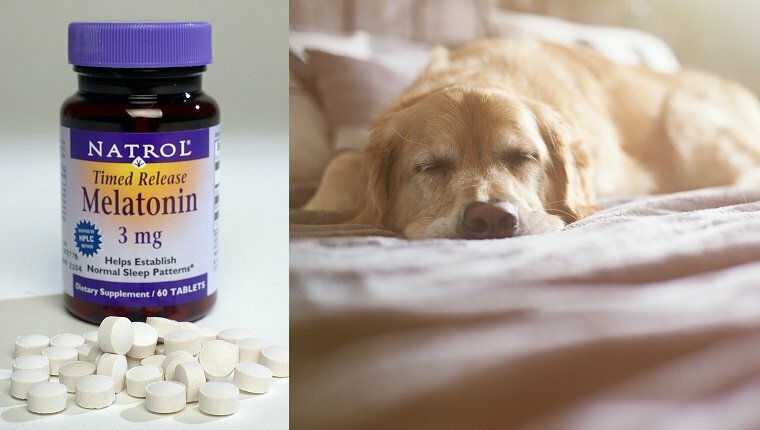 While melatonin is often recommended as a sleeping aid for humans, it has numerous benefits for our canine friends as well. From anxiety, hyperactivity and general restlessness to hair loss, this naturally occurring neurohormone can help pet owners treat these perplexing conditions at home. Melatonin is a naturally occurring hormone found in the body. Secreted by the pineal gland, it helps set the sleep/wake cycle in humans and animals alike. Our bodies are designed to create more melatonin at night and then decrease production during the daytime. Hence as a hormone, it helps with the circadian cycle by establishing sleepiness and then maintaining the sleep state. Melatonin can also be purchased as an over-the-counter supplement. This is the product both humans and dogs can take to treat numerous conditions. While melatonin for canines is not yet FDA approved, it’s considered to be a safe, effective supplement for most dogs. However, pet owners should still always consult with their veterinarian before starting their dog on melatonin, in regard to efficacy, dosage, and possible contraindications. Melatonin should not be given to pregnant dogs or young puppies. And as with all supplements, owners should take into consideration other medications their pets are already taking. How Does Melatonin Work in Dogs? Melatonin acts as a calming agent in dogs due to its sedative-like nature. Since dogs already produce melatonin naturally, the supplement simply boosts their intake of the hormone and helps to calm them down. As previously mentioned, melatonin has multiple uses for dogs. Listed below are some of the conditions melatonin is said to treat and how it’s alleged to work. This is a form of intense anxiety exhibited by some dogs when their owners leave the room or house. This can be demonstrated by non-stop barking, hyperactivity and destructive behavior. Melatonin’s calming effect should help most dogs with this condition. Whether it’s the sound of fireworks or a fear of strange places, canines can develop an intense fear that leads to trembling, drooling, and other undesirable behaviors. The soothing properties of melatonin are considered by many to be an appropriate remedy for these situations. During treatment or recovery from serious injuries, melatonin is often used to keep dogs calm. Just like humans, on rare occasions some dogs have issues settling in and falling asleep at night. As previously mentioned, melatonin is a necessary part of the sleep cycle process. By supplementing their intake of the hormone, dogs will often slip into deeper, more sustainable sleeping patterns. One of the most common endocrine disorders found in canines, Cushing’s disease is the result of an overproduction of cortisol in the body. This disease is typically exhibited by increased appetite, thirst, and excessive urination. Melatonin in this situation is used to help inhibit cortisol levels in the body, hence better controlling Cushing’s disease. This is another endocrine disorder that can result in partial baldness or even a complete loss of fur. Unlike Cushing’s, however, melatonin is used in this case to improve the quality of a dog’s coat and is believed to help stimulate coat growth. What Are the Side Effects of Melatonin Usage in Dogs? Due to the sedative quality of melatonin, dogs may appear confused or disoriented. Tachycardia: Tachycardia is defined as an unusually high heart rate. While most side effects are mild, owners need to be aware of these conditions when giving melatonin to their dogs. If any side effects are noted, owners should immediately stop using the supplement until discussing the situation further with their veterinarian. Where Does an Owner Obtain Melatonin? Melatonin is an over-the-counter supplement, although some veterinarians will also provide it to their patients. Be advised that certain companies use xylitol, an artificial sweetener often found in gum and other products, in their melatonin. Xylitol is highly toxic to dogs, so always read the entire label of any melatonin product you’re giving your pet and if you have any doubts whatsoever, be sure to consult a veterinarian for advice. What Is the Dosage for Melatonin in Dogs? Melatonin can be taken on an empty stomach, however, if any stomach distress is noted, it’s recommended to consume it in conjunction with a full meal. Dosages should not be given more than three times a day and the results should be noticeable within 10 to 15 minutes of administration. Results typically last for approximately eight hours. 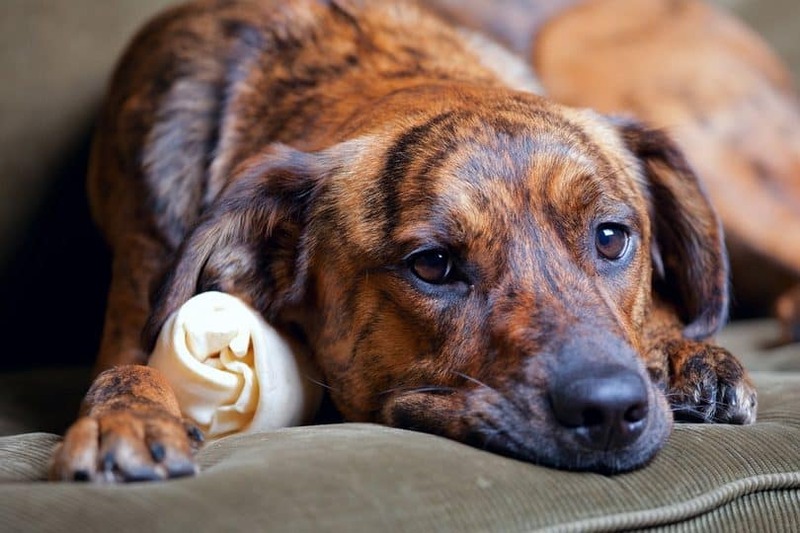 Giving your furry friend melatonin is a natural way to treat many different canine issues. For owners who prefer to avoid giving their dog pharmaceuticals, the supplement should offer relief for both owner and canine alike. Dogs and cats share a very strange relationship. Most of us have gained knowledge about them probably through an old cartoon or the various children’s playbooks. In reality, challenges are very different than what we used to see on TV. There would have been times you may have felt something wrong, especially when it comes to their food. Even after maintaining a balanced and adequate diet for both of them, if you feel your cat has lost some weight. And at the same time, your dog has been putting on some extra pounds. Then there is a chance of theft in the house of the infamous burglar itself. 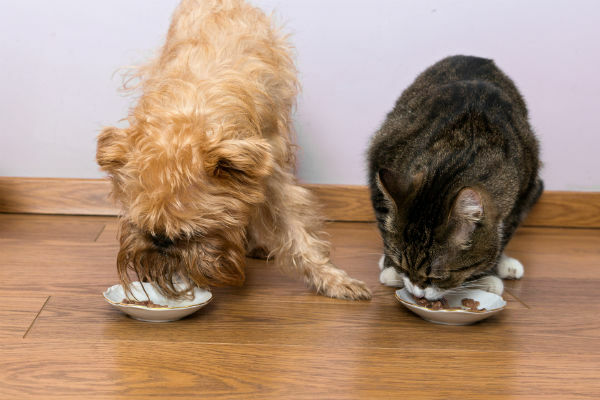 Your dog is probably eating cat food. This habit is very unhealthy for both the animals as one can be eating more than necessary and the second one may suffer from malnutrition. There are even chances of your dog getting sick and suffer from vomiting, diarrhea or any other stomach related issue. The most basic thing as an owner will be to train your dog and cat for the most basic of instructions. For example, if you see your dog snooping into the cat’s food space, then you need to have a definitive action or a command. This will be an indication for the dog that he is doing something wrong. The best call is to have your dog’s training started at an early age. Puppies understand commands and instructions better as they are more receptive. It is very difficult for an old dog to change his bad habits. You may also like: top 7 best cat food for hairballs on the market. Before entering any playground it is necessary to lay down the ground rules loud and clear. Therefore before getting started with the training, you will need to have a clear distinction on a few things for sure. 1. Very different looking food bowls for the dog and the cat. 2. 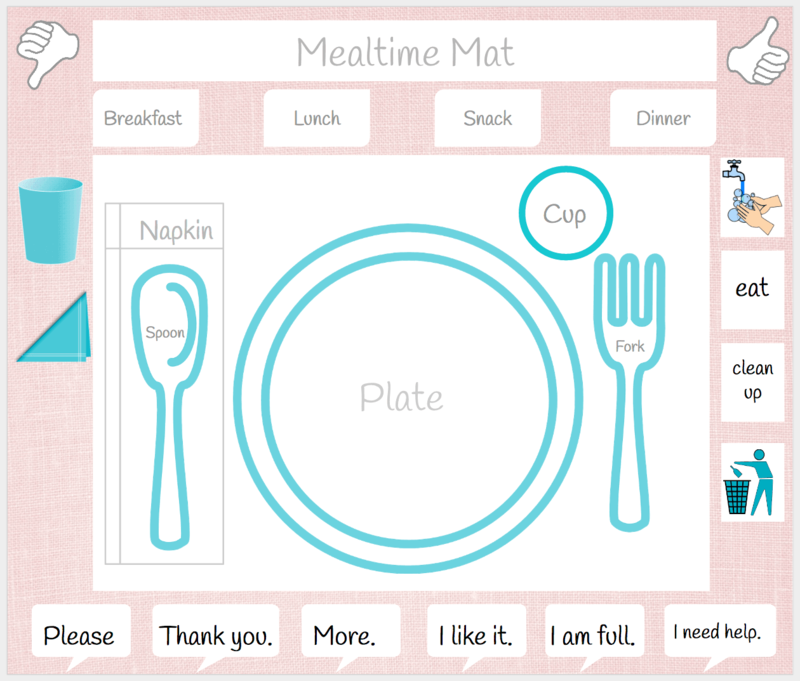 A distraction-free zone for food. 3. 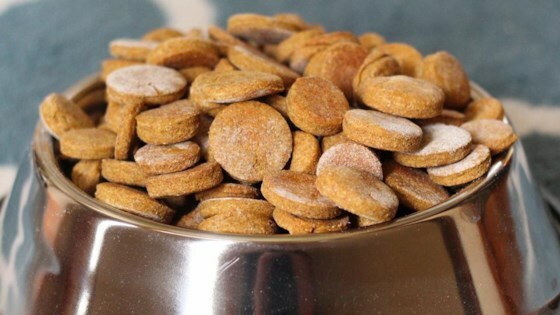 Some treats for your dog or dividing his favorite food into parts. 4. Positive attitude and ton loads of patience. 5. Time out of your daily routine for daily training. 1. Treat Lure – You can start making your dog follow your instructions, as you will be giving him a treat for leaving alone the cat food. This will assert your status as the leader on the dog and make him believe that he needs to follow your instructions at all times. 2. Leave It – This command should get embedded into the mind of the dog. Issuing a demand does not need you to shout at him, which can have an adverse effect. It should be assertive at the same time he should be able to understand it and follow. 3. Tempt him – Tempting your dog with a treat, will make him excited, but don’t make it easy for him to get it, so he can give up on it. Just let him have a sneak peek by letting him lick and smell it. 4. Reward – Just as he gives up the treat you should praise him and reward him with the bigger treat. This will make him understand that leaving one good thing can lead to an even better one. A 10 min routine every day is enough to make him habitual to him. 5. Cat Food – It’s time to introduce cat food into the mix and try the �leave it’ command on it. As he follows the command, you should reward him with a treat. After a reasonable number of successful commands, you should gradually reduce the treats as well till the time of no rewards. 1. Elevate cat food – You can keep the cat food at a higher place where the dog cannot reach it. When the dog will not be able to see the thing, he will eventually start to get his mind away from it. 2. Move cat food – You can move the cat food to a different location like another room which should only be accessible to the cat to consume. 3. Don’t forget the cat food outside – Get your cat to follow a habit of eating according to a schedule. As soon as the cat’s eating time gets over, you should pack the cat food away in a cupboard. 4. The Baby Gate – These gates are very convenient and easy to install. Make sure that only your cat can go into space where you need to feed it and avoid your dog in the process. 5. Consistency – You need to be alert in snatching the cat food away from the dog before he tries to eat it. Consistency is the key with this habit, which will make your dog understand that this is a NO situation. His habit will eventually fade away due to this. 1. Change his food – One reason for eating cat food instead of his own can be that the dog doesn’t like his food. You should definitely try and change his meal and try different options for it. 2. 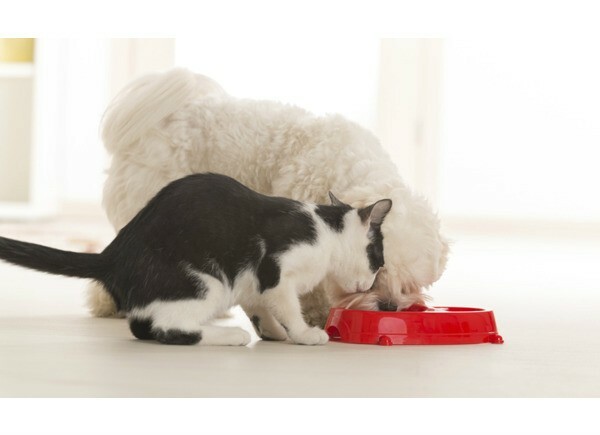 Routine – With the above new food options available with the dog, start feeding them both at the same time. With added taste to his own food, the dog will not go for the cat food. 3. Physical Barrier – While your dog and cat feed you can act as a physical barrier between the two. With this, you will be able to stop your dog from going towards the cat food. Saying NO will work here and make him understand it is wrong to do so. 4. Rewards – When there is a NO, there should be a reward. You can praise him when your dog moves away from that space when you ask him not to. Play with him to make him feel, he did the absolute right thing. 5. Final line – Eventually you can stop being the barrier and just work your magic with the NO command. He will slowly start to follow it and understand the right thing to do to keep you happy. That would be to stay away from the cat food. Go for the method that you feel will be suitable for you and your dog. Train him to be obedient and save the cat food. We need our fair share of sleep at night – the same can be said about our dogs too. You might be saying – we all have a proper bed for our beloved pets! Yes, but do you have a plan for your dog while camping. You must pack a dozen things before you go on a camping trip. But how many of you get a comfy sleeping bed for your beloved dog. You shouldn’t expect your dog to have a goodnight-sleep in the cold earth, should you? So, the next time you are planning to shop for your next camping trip make sure you buy a sleeping bag for your dog as well. 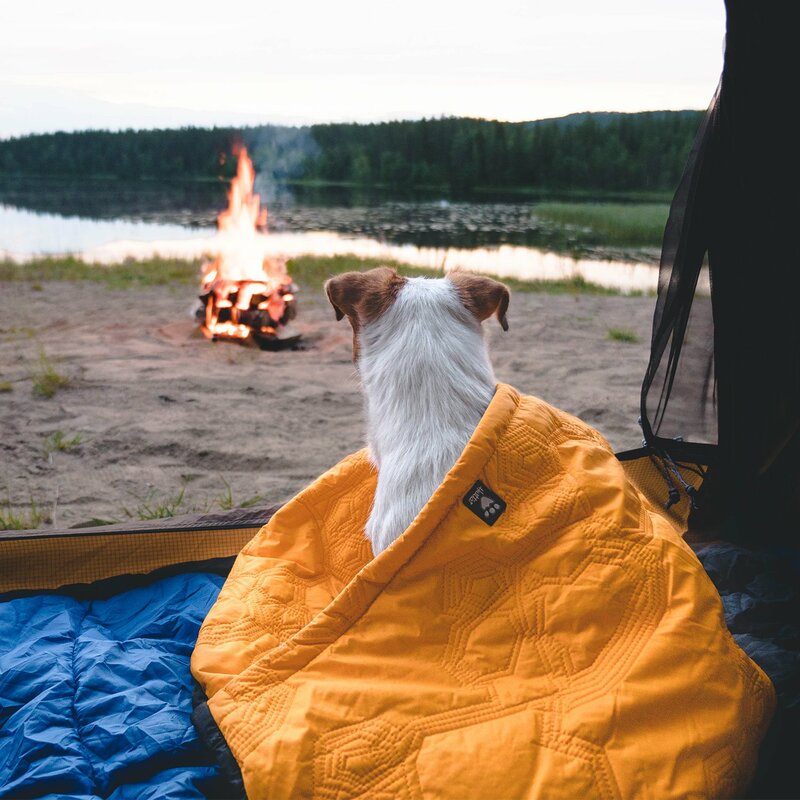 So today, I am going to reveal some of the best dog sleeping bags that would make your dear dog comfortable in the camping as well. How Do You Choose the Best Dog Sleeping Bag? 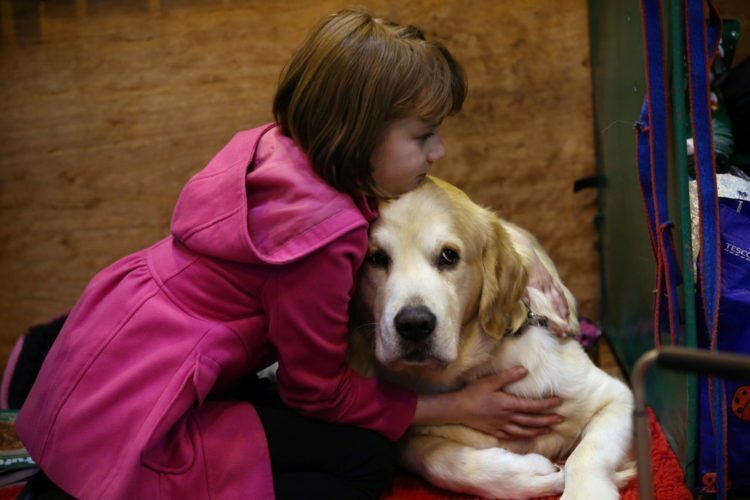 Dogs have a warm heart – we all know that. But they also have a warmer body temperature. That being said, they can catch pretty easily too. The normal body temperature of a dog ranges from 1010 to 102.50 Fahrenheit. You and I have a normal average body temperature of 97.60 Fahrenheit. This is an indicator that you and your dog will feel the cold almost at the same time. So, if you are planning camping in a cold region, you should think a good way to make your dog feel comfortable. Thus, comes the importance of a sleeping bag for dogs. So, how should you choose the sleeping bag as you can find a variety of construction and design available? I think you should identify your dog’s natural stance in sleep. Some dogs love to curl up just like a baby, while some dogs sleep spreading or stretching their body. This is vital as you will have to buy a perfect sleeping bag that would suit your dog the most. So here are the commonly found sleeping bag style available in the market. If your dog loves to curl in a small congested space, you should choose the cup variant. These sleeping bags look like your coffee cup. Your dog could easily fit in and curl inside as the inner surface is most suitable for that. I know some dogs just don’t have a proper sleeping pattern. It can spread out its legs, roll around during sleep, and even go upside down – there is no way to be sure about things. Yes, they look really funny and cute! The best option, in this case, would be going for the flat beds. These flat beds are quite similar looking to the common human sleeping bags. Imagine a room like a shape where your dog could go, stretch out the cover, make things cozy, curl up, and have a great sleep. It already sounds peaceful, isn’t it? 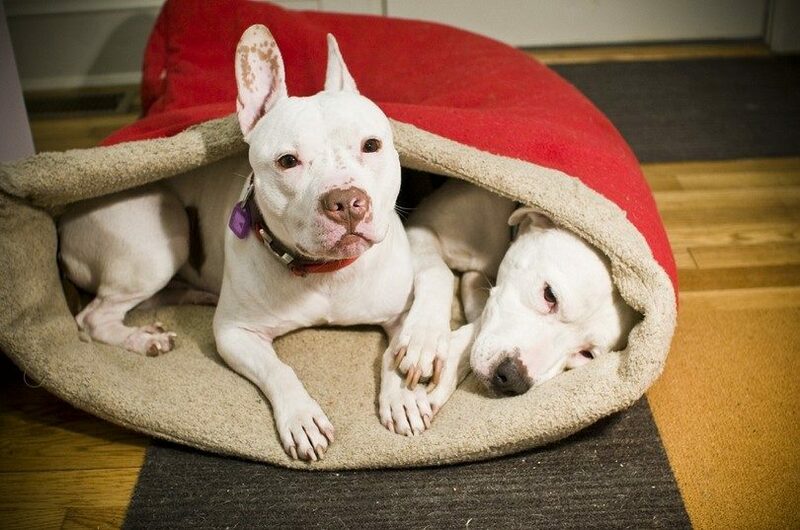 The cave style sleeping bags resemble the natural caves where your dog could nest in. Some dogs just love the room-like shape. This variant of almost the same as the cup style. But this one is fluffier and more comfortable inside. Some say this one looks a lot like a bean bag inside. I personally think the dog pods are better than the cup style as they are more comfortable and keep your dog warmer in the chilling cold. Okay, I think you are clear now about the types and variations available in the market. Now, I want to share some great tips that would help to choose the proper one. As I have mentioned earlier, always choose the bag that goes with a sleeping pattern your dog. It doesn’t matter if a particular design looks cute – if it doesn’t suit your dog then what’s the point? It is wise to choose a padded-bottom layer. In that case, if you are hiking on a rocky trail, your dog could get a comfortable floor for sleeping. Always choose a water-proof sleeping bag. If somehow the bag gets wet, your dog will be nothing but suffer in that bag. I also feel that the sleeping bag should be breathable. Don’t go for too soft material; your dog will just tear out the bag! I mean c’mon, dogs are meant to be playful. They are going chew and bite the sleeping bag no matter how much you train it. No bag is useful in both the summer and winter season. The summer camping calls for lighter sleeping bag, and in winter you should look for heavy and more cold-resistant versions. Last but not least, you should consider the size of the bag properly. The big sized dogs cannot fit in the smaller ones and vice versa. Pick the one that would make your dog comfortable. I think Ruffwear did a terrific job designing this sleeping bag. This is a bag that serves dogs of all sizes. The size dimension is 35″ x 26,” and it has a 1” loft. Yes, I have said you should pick a bag that goes particularly with your dog’s size. But I loved the superior build quality of it. The sleeping bag is sturdy tough yet very light. It is made from synthetic fibers, so it is completely water resistant. The installed bottom pads are quite comfortable enough, but if you want extra comfort for your dog, you buy the additional Ruffwear – Highlands Pad. The synthetic insulation can keep your dog warm even in the blistering cold. The only downside to this sleeping bag is the smaller dogs will feel overwhelmed by the space, and you wouldn’t be able the zip the opening as it could cause suffocation to your dog. I personally think they should have made two different sizes. 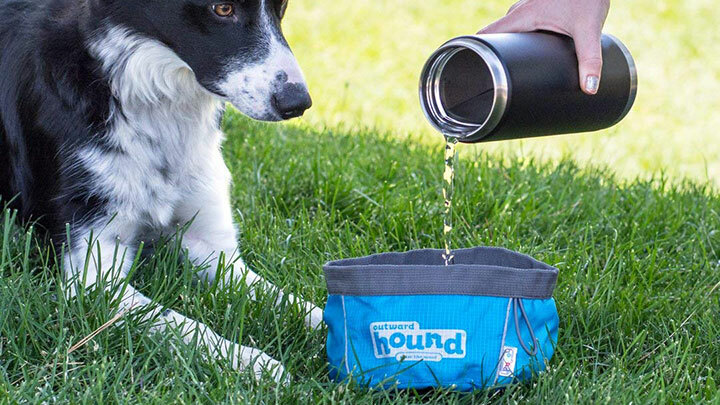 If you are still not happy with the Ruffwear – Highlands sleeping bags, Hurtta Outback Dreamer will quench your thirst. This one is waterproof and has heat reflective insulation technology. So, you can use this one both in summer and winter. You can even use in your home as a perfect sleeping mat too. 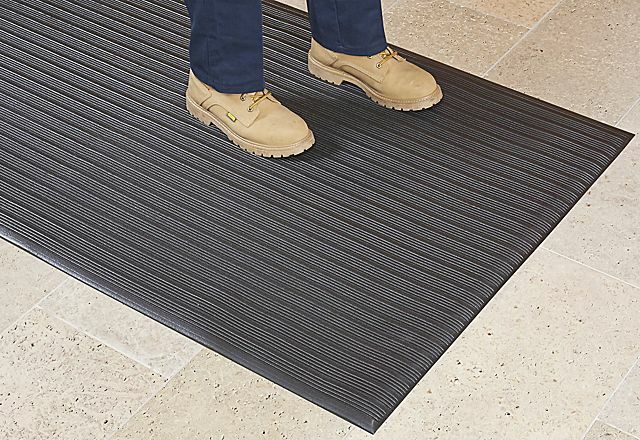 The construction material is called houndtex – it is breathable and lightweight. 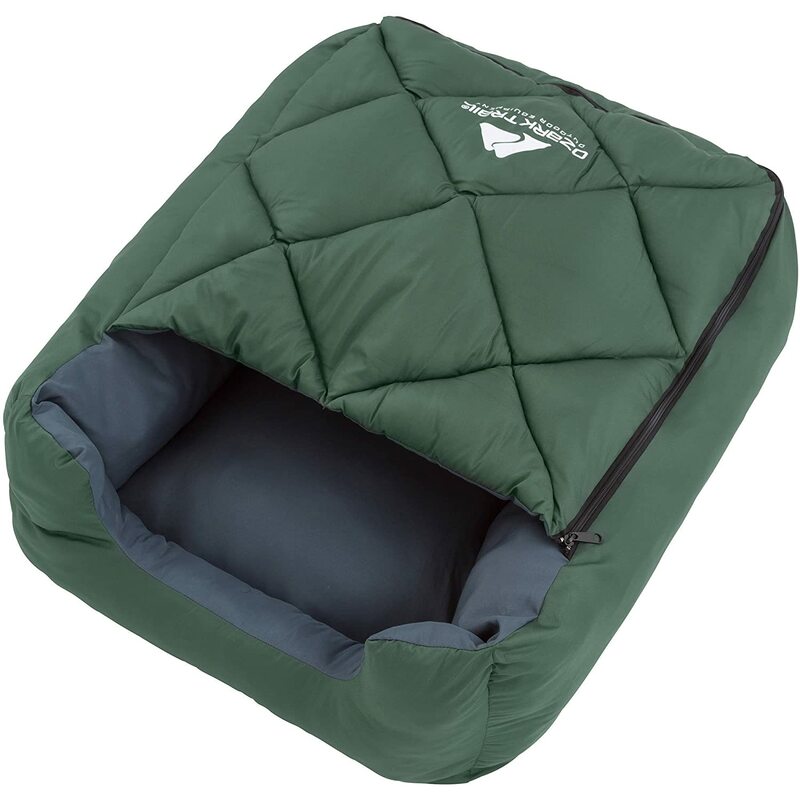 This round sleeping bag is specially designed for the “curlers.” Most of the reviews that I have checked say that dogs just love the comfort and softness of this sleeping bag. There is a drawback here too. There is no zip around the edge like the previous one that I have mentioned. That means you will have to train your dog to sleep in it before you go on a hike with your dog. While this a great sleeping bag for the smaller sized dog, the big mutts can find it difficult to fit in! Sadly, they don’t offer XL size which is a big bummer for me. 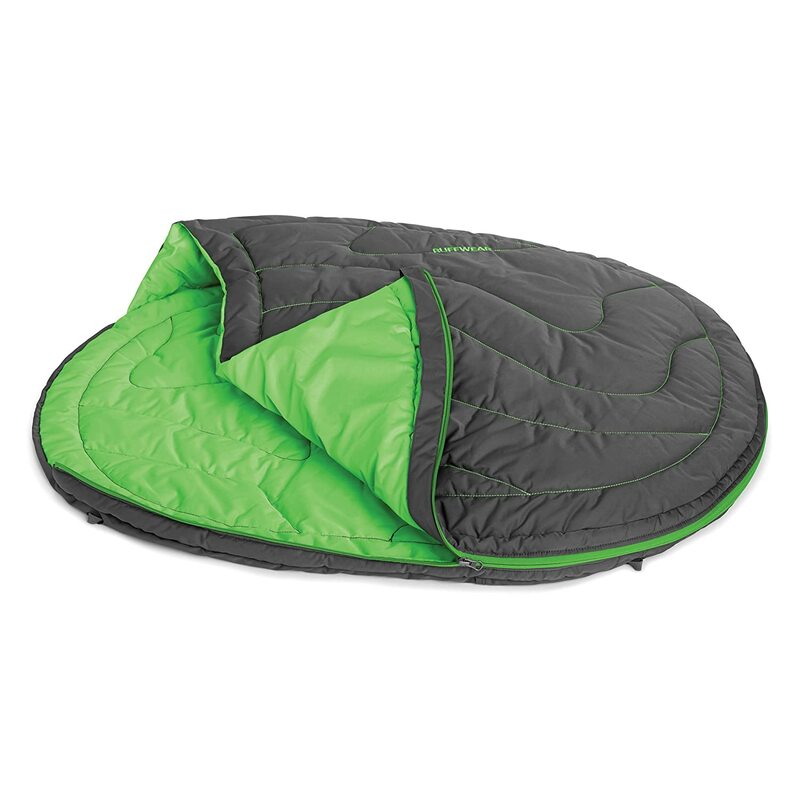 The last one in my list today is the Ozark Trail dog sleeping bag. This one has a unique rectangular shape that makes look quite lovely. It doesn’t only look great but also has great functionality. 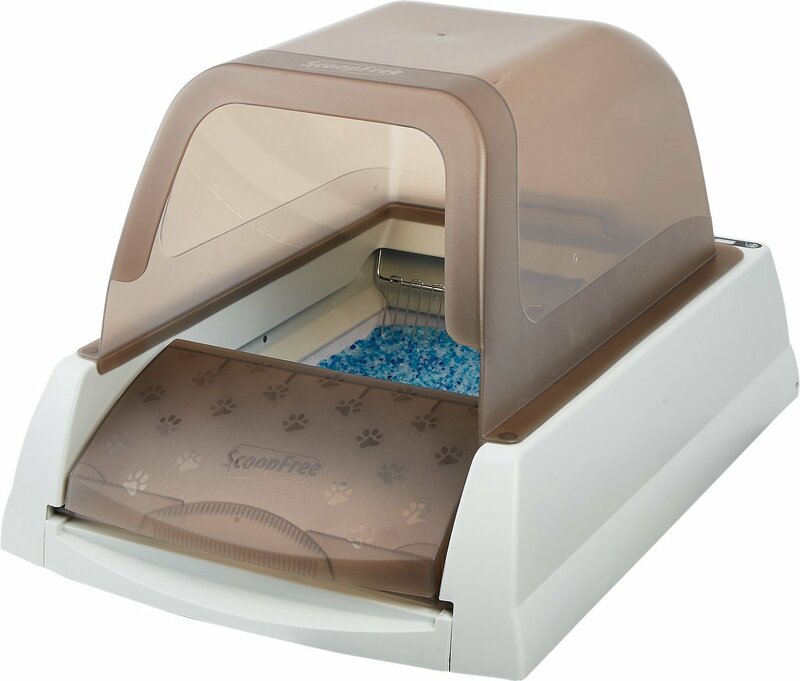 You can also use this one as sleeping beds at home or take it to friends’ home and let your dog sleep here. Ozark Trail might look bulky but it weighs on 2.5 pounds, and you could even roll it up and pack it. This one is perfectly insulated and feels very comfortable and fluffy. Your dog will love you for buying this one! If it is too cold, you can just zip it up and create a cozy space. You will not have to be worried about breathing problem as the material is breathable and machine washable yet water resistant. The only downside is it is not suited for the bigger dogs as it is usable for dogs weighing 45 pounds or less. So, that was my take on the best dog sleeping bags. I hope the reviews and the buying guide helped you. Among the mentioned three, choosing a winner is a tough nut to crack! If I had to, I would say Hurtta Outback Dreamer is the better choice among the three as it comes in all sizes and seems super comfortable. Moreover, I have seen a lot of dog owners praising this one as their dogs love it. So, what do you think about this article? Let me know in the comment section below! Saying goodbye to a lifelong friend of the furry kind might be one of the hardest things you’ll ever have to do. So it’s no wonder why most, if not all, of us want to extend the lives of our beloved pets even when it seems the end might be inevitable. In some cases though, euthanizing your pet might be a better solution. Of course, it is a bitter pill to swallow, but watching your pet endure the pain of disease and deterioration might be far worse than the not having them around. Guaranteeing your pet’s health during his younger years can help extend his life and reduce the chances for certain types of disease. So be sure to take him to a holistic pet hospital regularly for check-ups, vaccinations, and immunizations that are necessary for his overall wellness. Remember though – euthanasia is irreversible. So you need to make sure it’s the better choice before you jump to a decision. Not sure how to tell when to pull the plug? This short list should shed some light on the matter. Dogs will typically throw up even on healthy days. But the inability to eat or keep food down in the presence of a known disease or illness should be the first sign that your pet is struggling more than he’s letting you see. 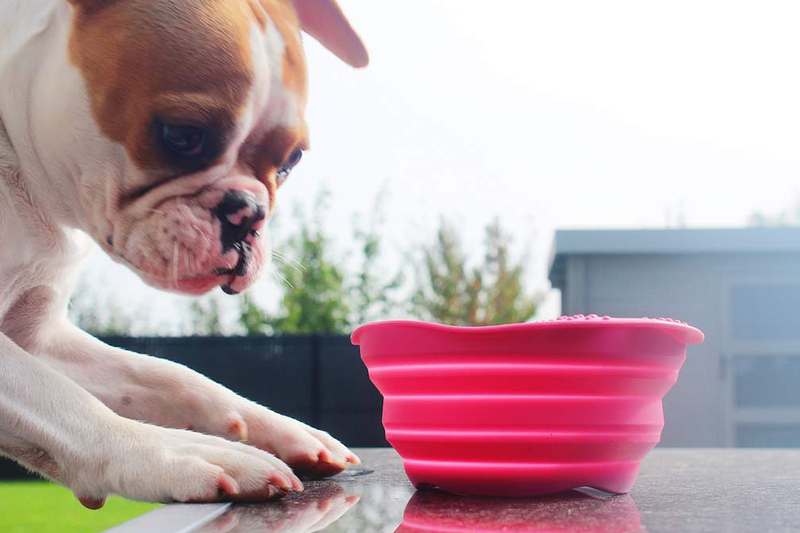 Lots of factors can come into play to explain why your pet just can’t seem to eat. In sick animals, it could be a sign of organ failure or significant intestinal protein loss. Even housebroken pets will have an accident every now and then. 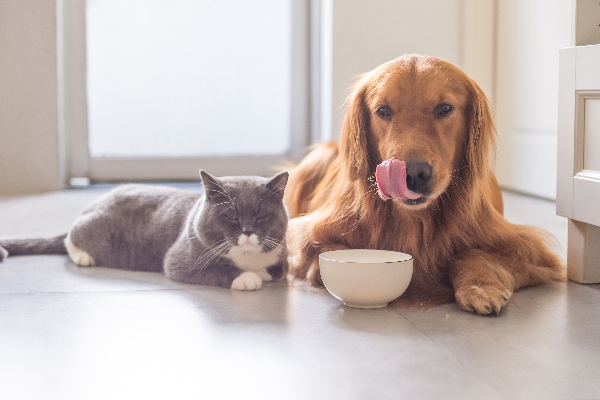 However, if your pet has totally lost control of his bowels and bladder, it might be a sign that his illness has progressed to later, more severe stages. Incontinence can be taken as a sign of nerve damage. As his body continues to fail and deteriorate, certain functions will wear away. Failing to control bladder and bowel functions might be a sign that he’s nearing the end. At this point, you may also want to inspect the stool for texture, foreign contents, and blood. Pain in pets can stem from a number of causes. You should be careful and attentive if you want your pet to be healthy even when you are away. But if you’ve noticed that your furry friend has been showing signs of pain for several days or weeks, then you may want to rush him to a holistic pet hospital. Some markers of pain in pet dogs include whimpering, refusal to move, defensive behavior, and general lethargy. If you know that your pet is sick, then pain could be a sign that he’s in the later stages of the illness. Limping shouldn’t be a cause for alarm if your pet isn’t sick. 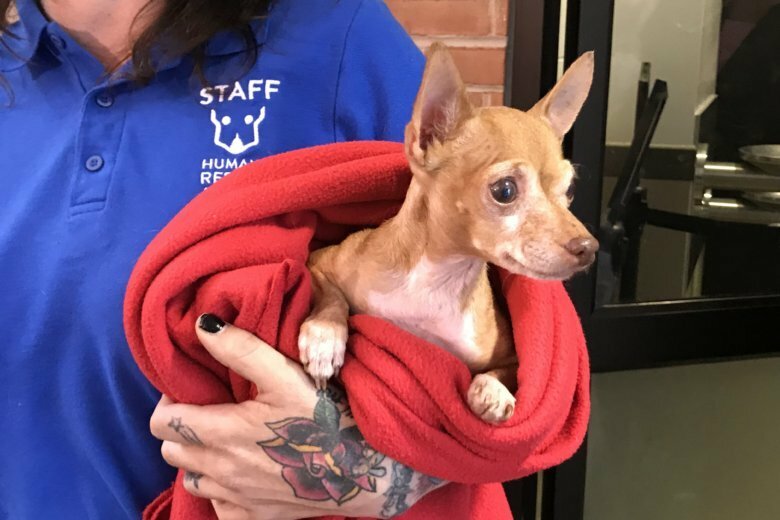 But if they’ve been diagnosed with disease and they start showing signs of difficulty with ambulation, then you might want to discuss euthanasia with your veterinarian. Difficulty walking and standing are signs that your pet is experiencing pronounced pain, usually in the abdomen. Observe your pet when he starts to show this sign – if they go from limping to refusing to stand or walk at all, it might be time to bid farewell. In their effort to overcome pain, weakness, and that overall feeling of unwell, pets will reduce their activity levels. This helps them regulate what little energy they have, so they can stay awake and alert during times of disease. So any sick pet will seem to move particularly slow, and may sometimes even refuse to move at all. You’ll also notice that your pet might lose the motivation to do things that he used to enjoy. For instance, his favorite toy might no longer spark his interest. In the face of disease, your pet will degenerate over just a short period of time, depending on the illness he has. During the late stages of any disease, your pet might show signs of difficulty breathing. Labored breathing, pathological lung sounds, and frequent coughing are some signs that your pet is exerting extra effort to inhale and exhale. You can assist them at this point by elevating the head and making sure there isn’t anything obstructing his nostrils. If your pet is suffering from disease and you feel he’s nearing the end, don’t leave him to suffer. Euthanasia might seem like a painful last step, but with the help of an experienced veterinary professional, you can welcome the change with an open heart and mind, knowing your beloved pet has successfully and happily passed the rainbow bridge.